PAINTSVILLE, KY — After losing by a combined 50 points in two earlier matchups in December, Lawrence Co. ( 19-7 ) won an 88-83 overtime barn burner over Johnson Central ( 19-6 ) who wore Oil Springs uniforms on throwback night at Eagle Fieldhouse Thursday night. Cody Maynard after draining a three pointer in Overtime. The Bulldogs beat the Golden Eagles for the first time since 2016 and for the first time in Paintsville since 2009. Both teams started fast and were tied at 17 apiece after one period. The Dawgs out scored Johnson Central in the second quarter 18-11 and led 35-28 at Halftime. Tyler Maynard with the off balance finish against Johnson Central. In the third quarter Lawrence Co. went up 50-39 before Johnson Central called a time out. The Golden Eagles then went on a 19-4 run to end the period and led 58-54 going into the final period. 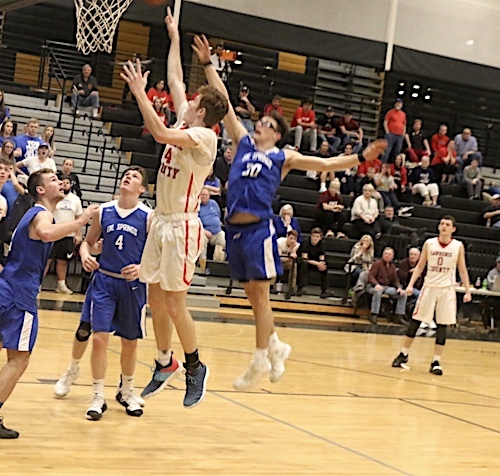 In the fourth the Dawgs trailed by as many as six points before taking the lead down the stretch before Johnson Central tied it up at 71 with 14 seconds and Lawrence Co. didn’t get a good look and the two teams went to overtime. In OT Tyler Maynard and Cody Maynard hit back to back three pointers and the Bulldogs closed the game with good defense and free throw shooting to pick up a great road win. Cody Maynard poured in 30 points, Tyler Maynard tallied 23 points, 6 rebounds and 3 steals. Chase Sartin 12 points and 7 assists, Noah Fairchild 11 points and 13 rebounds, Alex Ratliff 7 points and 6 assists, CJ Fairchild 3 points and Baden Gillispie 2 points. LCHS went 10-21 from the three point line and 16-24 from the charity stripe. 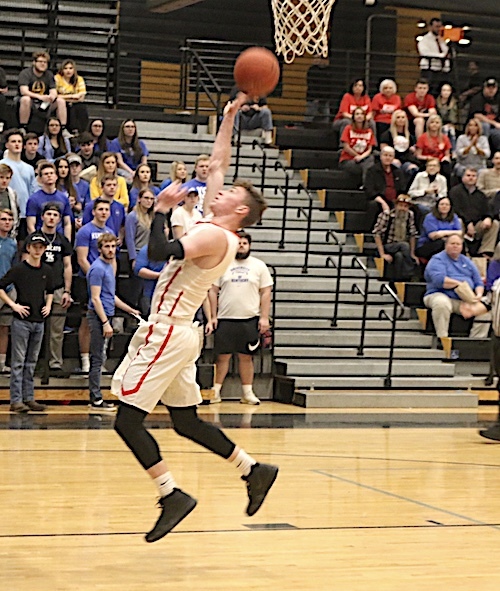 Cory Vanhoose led the Golden Eagles with 40 points on 19-20 shooting, Isaiah May 15 points, John King 12 points, Gabe Ferrell 7 points, Braxton Bentley 4 points, Jacob Butcher 3 points, Josh Slone 2 points. JCHS went 4-13 from the three point line and 9-14 from the foul line. WARFIELD, KY. — The Dawgs traveled to Martin Co. and came away with a road victory over the Cardinals ( 9-16 ) on Tuesday. 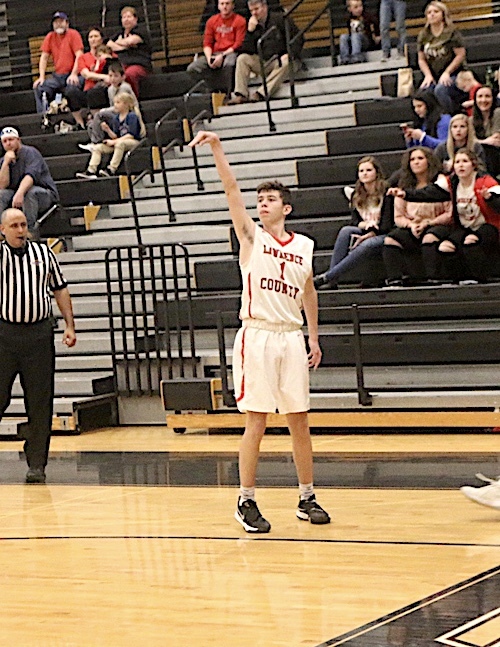 Cody Maynard hit 5 three pointers and scored a team high 25 points, Tyler Maynard tallied 22 points, Alex Ratliff netted 7 points, Noah Fairchild, Baden Gillispie and Chase Sartin had 5 points each, CJ Fairchild chipped in with 4 points. Sheldon Clark was led by Trey James with 25 points, Braxton Maynard tallied 15 points, Jordan Dalton also hit double figures with 10 points, Braden Walker 5 points, Nick Maynard and Will Lafferty had 4 points apiece, Dawson Mills 3 points. LCHS hit 8 three pointers and went 16-25 from the line. SCHS hit 6 three pointers and went 12-15 from the line. Lawrence Co. will travel to Paris Saturday afternoon for a 3:00 game with the Greyhounds and then celebrate Senior night vs Russell on Monday night.